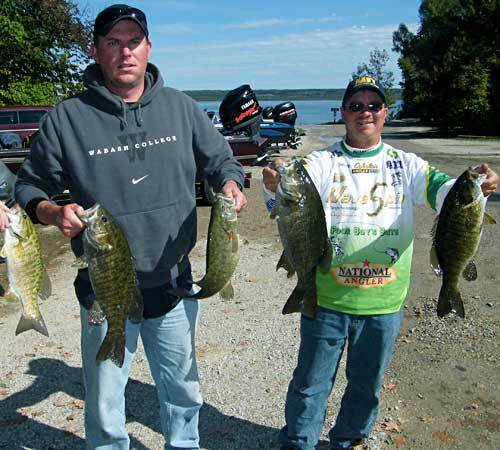 As previously reported, LGMOUTH and KHefner won the 2011 Fall MadWags Memorial members' tournament easily with the only limit weighing 16.61 pounds and big bass of 4.65 pounds. We had a new winner in the coveted Big Ugly category with quite a twist! 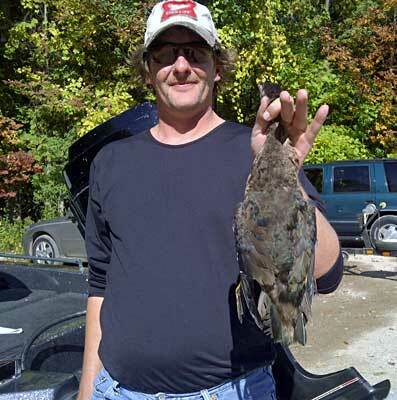 Here are the complete results of another fun event on a beautifal fall fishing day in Michigan on a surprisingly tough day that warmed up almost 50 degrees!! LGMOUTH and KHefner took home $65 for first place and $40 for the big bass along with big prize packs along with an additional prize pack for big bass filled with great sponsor-donated tackle and gear including $20 gift certificates from Whopper Baits! 2nd place Cy and Firefighter Jeff won $35 for their 2 nice bass and prize packs. Prize packs were given out to the top 5 teams, big bass and the Big Ugly award including Wavespin reels for big bass and Big Ugly! Everyone who stayed for the weigh in received a complete bass fishing kit from K&E Stopper Lures. In addition, Grandt Rods is offering 30% off the website pricing to GreatLakesBass.com members through 10/15/2011! Contact me for a discount code before you contact Grandt Rods. See the complete list of 2011 Fall MadWags Sponsor donors below! 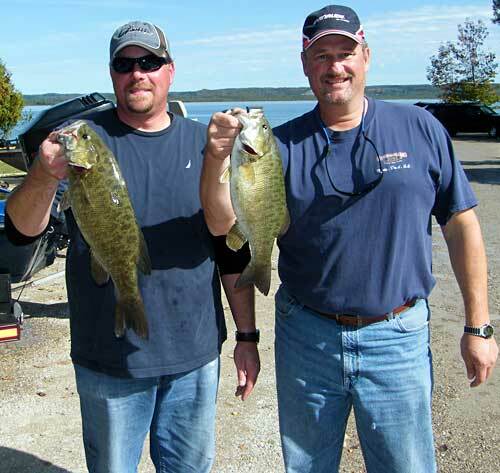 Cy and Firefighter Jeff took 2nd place with 2 nice smallmouth bass weighing 7.06 pounds! 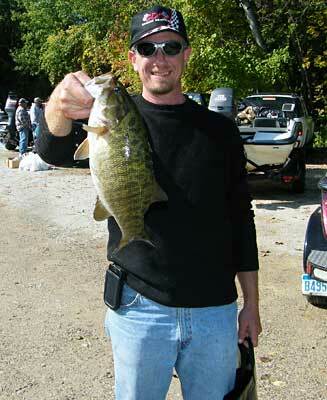 They just missed out on big bass with a nice 4.49 pounds smallie! thedude had to put up with both Genie and me all day but he still managed to land our only bass (if you haven't fished in a long time, you should check your drags Genie) and take 3rd place with this one real, real fat 4.29 pounds smallmouth bass caught deep! This is one of the things I love about these events! 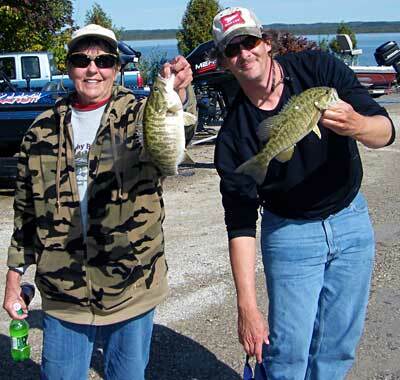 TheFishinPollock fished with his Mom in her first bass tournament ever to take 4th place! Each of them caught a keeper and 'Mom' also helped me decide to award the Big Ugly to her son for the only other legal 'catch' brought in thanks to a strategic error by Cy! 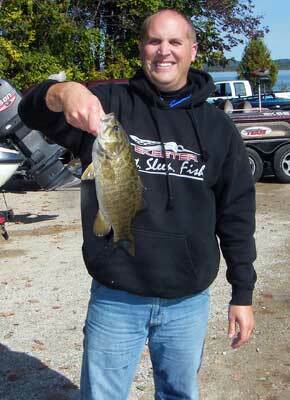 fasttrack caught his one keeper smallmouth bass fishing with Waterfoul to take 5th place. 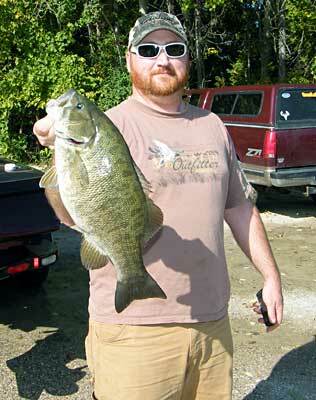 BadBassFisherman belied his username by landing a keeper bass and taking 6th place while fishing with tjrock. 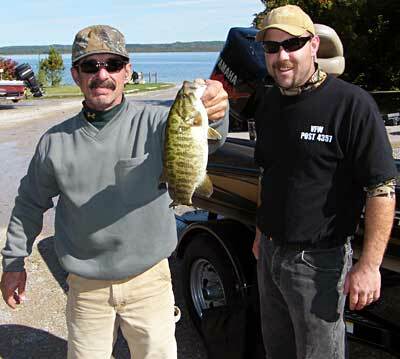 7th place went to father and son team stackenem and Head here with their one keeper smallmouth bass. See the updated DK Open Champions online virtual plaque for the history of all the winners. I always ask that you please, please, please consider the companies that make GreatLakesBass.com possible to keep going. I could not continue without them and without you giving them a chance and telling them when you do. 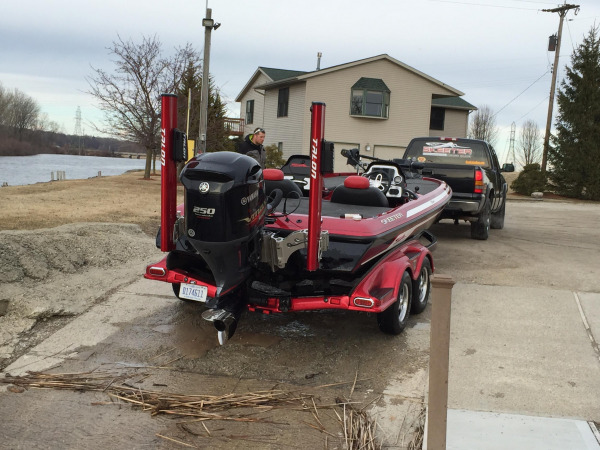 ALL the sponsor advertisers of GreatLakesBass.com make it possible to continue growing and keeping the site as safe and clean as possible. Visit the site sponsors link when you get a chance to review the broad range of choices available from quality companies for insurance, loans, extended warranties, quality bass tackle, quality fishing rods, boats and motors, service, special fishing tools, fishing line, awesome fishing trips for huge largemouth and peacock bass and more. Lots of specialty tackle from some great companies! I try to work with the best companies and products because you are all my friends. Whopper Baits perfected fishing lures including the best finesse worm in the business - the Thinesse Worm! I also want to thank LGMOUTH - Don Watts for weigh equipment support and an additional WaveSpin Reel donation for the event! had a great time. if its any consolation - the fishing was off again this weekend. we were there again saturday and it was pretty dead. only got 1 short fish on elk/skeg for 3hrs effort in the morning. we bounced around a couple other lakes and didn't get into a good bite until the last 2hrs of the day, but those 2hrs made the whole day worth it. Water temps were still around 60 up there... still too early i guess! Glad you got into those 2 hours anyway!! We should have went to Torch. We could have caught some toads and made LGMOUTH's puny 16.61 pounds look like Indiana fishing!! Next. If there is a next time. Too funny! Catch any bass?!!!!!! Dad and I both really enjoyed the day, had a good time. Would have liked to have had good fishing, but the weather turned out great. You guys were the rowdiest group of guys my dad has been around in quite some time. He found your senses of humor to be quite funny. See everyone in the spring. And no one got arrested! That was pretty good too! Glad Dad had a good time. And Mom too. We had quite the mix at our event. Fathers and sons. Mother and son. Grandpa and granddaughter. Cousins I think... quite the party! Thank you Drop Shot Dennys!